Need to convert a DOC file to PDF? Or maybe a PDF to a JPG file? There will always come a time when you’ll have to convert a file of one type into another and you will probably want to do it as fast and as cheap as possible. Of course, if you work in an office and have to convert files everyday, your company will probably purchase a commercial converting application and that’s definitely the best option. However, if you only need to convert files a couple of times a year and you don’t want to drop $50 on a program that just converts Word docs to PDF files, then you only other option is to use free online conversion tools. These are basically sites that let you convert between many different formats and are usually free for small conversion projects. They make money by trying to get you to sign up if you need to convert more files or larger files, etc. In this article, I’ll mention a couple of online conversion sites that I have used and that do a pretty good job, though they are not perfect. Even with expensive conversion software, you’ll always run into cases where the conversion output isn’t quite right and in those cases, you just have to try another service or edit your file to make it easier to convert. ZamZar has been around since 2006 and even though they push to get you to sign up for their monthly plans, the service still works well for free too. Of course, when things get busy for them, all the conversions for free users get pushed to the back behind all paying users. Depending on the time and day you use the service, it can take anywhere from 2 mins to 2 hours to get your converted files. When they first started off, they only supported a few dozen types of files conversions, but now they can do over 1200 types of file conversions. This includes documents, audio, video, images, ebooks and more. As I mentioned earlier, though, it’s only useful for a small number of files of relatively small size if you’re using the free service. To use it, just start filling out the section at the top. Then just type in your email address and click on Convert. 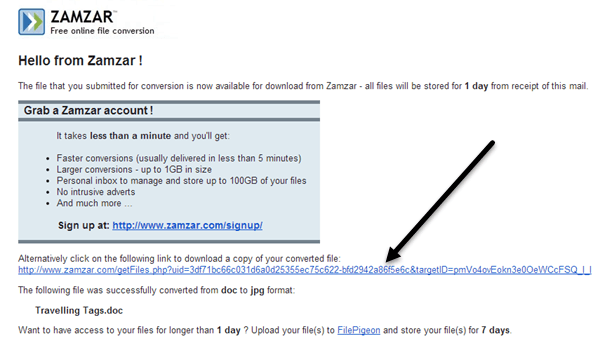 When your conversion is complete, you’ll get an email with a link to your converted files. 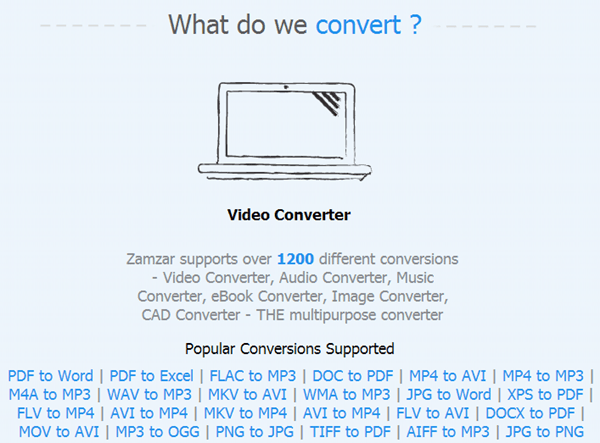 Another good online conversion tool is Online-Convert.com. Unlike Zamzar, this site is completely free with no paid options at all. They basically survive on donations and ad revenue it seems. Technically, there doesn’t seem to be a limit on the number of files you can convert, but I’m sure there’s some cap at a point. Anyway, the main page is broken down into sections such as audio, video, image, document, etc. 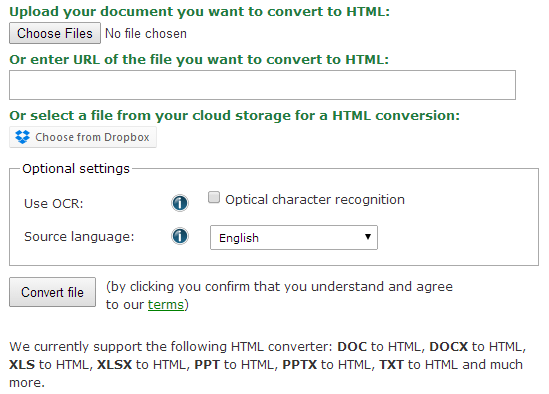 Go ahead and click the drop down and choose the format you want to convert your files to and click Go. Then click Choose Files and select the files you want converted. 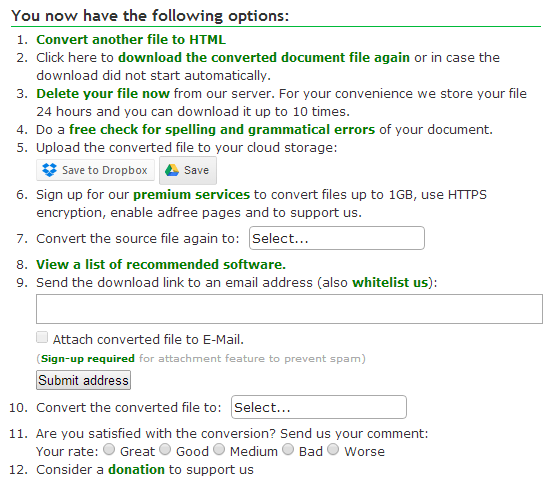 The nice thing about this site is that it lets you also choose from your Dropbox account if you want and it has some optional settings for using OCR and even being able to pick a different language for the source file, though your mileage will vary greatly. Those are two sites that I’ve used and have had good results with in terms of speed and conversion quality. You can also download conversion software, but it’s nearly impossible to find a freeware program that can handle so many different types of conversions. If you need to convert video files, you have a lot more free options like the awesome HandBrake. When it comes to document conversions, those free options just don’t exist. If you know of a freeware program that’s good for document conversion, let us know in the comments. Enjoy!